We see cooking here at The Well Garden as a wonderful opportunity to marry creative expression with function and practicality, and there isn’t a better season to reinvigorate your palette than the summer months when there are so many different fruits and vegetables available in abundance. It is also the season to experiment with flavour and colour–we are of the philosophy, that food should always, if possible, be as beautiful as it is delicious. The recipes below are three simple examples of how to make your tastebuds sing and celebrate sharing food with people you care about. ENJOY! The Well Garden is incredibly to lucky to have so many passionate people under it’s roof who not only hail from all over the world, but also happen to share a great love of eating well as well as talking a great deal about eating well. Robi, our Reception Manager, recently lamented about eating rhubarb compote during her childhood in France, and we were inspired to create a very simple desert – that also happens to be a rather delicious breakfast too. Put all the ingredients in a large baking dish, making sure to coat the rhubarb thoroughly with maple syrup and muscovado sugar. Place in the oven and bake for 25-35 min, or until the rhubarb has softened completely. 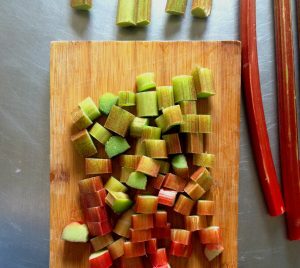 Make sure to stir periodically to prevent the rhubarb from sticking to the pan. Once the rhubarb has taken on a wonderful caramelised look (and smell) serve in small bowls with a generous dollop of crèam fraîche or coconut yogurt and sprinkle with the roasted flaked almonds. Any leftover compote, once cooled, can be kept in the fridge for up to four days. This recipe was originally created by the lovely owner of ‘Simply Delicious’, the tea shop and delicatessen in the small Suffolk town where Natasha, our Studio Development Manager went to school. Parsnip’s are often ignored until the autumn months but their natural sweetness lends themselves wonderfully to cakes. This cake is naturally dairy-free and can easily be made gluten-free too. The cake is incredibly moist and can be kept up to 3 days in a lined tin and is best accompanied with tea or coffee as well as a good discussion about anything you fancy with people you enjoy! Wash, peel and coarsely grate parsnips. Sift flour, salt, coriander/spices into parsnips. Stir in sugar, caraway seeds, coconut. Make a well in centre and stir in oil, and then slowly stir in the eggs. Pour the mixture into a greased cake tin preferably with greased greaseproof paper on the bottom. Bake for 35 min and then turn the cake around and bake for another 15-20min. Test with a knife (sometimes it is done sooner depending on the oven). During the last 10min of the cake’s cooking time, make the Honey glaze. In a small saucepan heat the sugar and lemon juice until the sugar dissolves, stirring w/ a wooden spoon. Add the honey-keep stirring. Then add the lemon slices and allow the mixture to bubble gently for a few minutes, or until the lemons start to look translucent and turn off the heat. As soon as the cake is done poke small holes into the top of the cake with a piece of dried spaghetti or skewer. 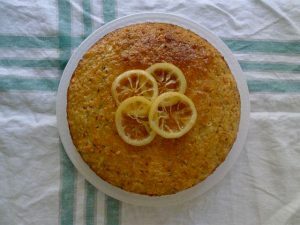 Brush the glaze generously all over the cake and position the lemon slices. Leave the cake to cool completely in the tin, and then carefully free from the tin and transfer to a serving dish. This delicious Rose Hibiscus iced tea was a huge hit at the Hackney Downs Open Studios event at the beginning of June. 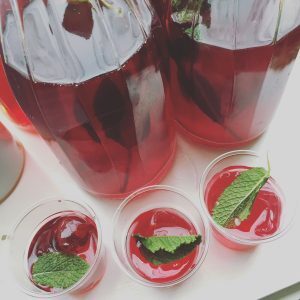 Our lovely Medical Herbalist, Molly Maitland, kindly concocted the brew for us and has donated the recipe for general merriment and wellbeing. It is very easy to turn this recipe into a summer cocktail with a good gin and sparking lemonade. In a medium saucepan or large teapot add the dried hibiscus flowers and cover with 2 litres of boiling water. Steep the flowers for 5min and then strain the liquid into a jug. (The strained flowers can be reused). Add the rose syrup, or rose water and honey if you are using them, and the juice of half a lemon. Stir with a long handled spoon until combined. Taste and add more rose syrup–careful anything with rose goes a long way–and/or lemon juice if needed. Once you are happy with the flavour, cover the jug with clingfilm and allow the tea to cool completely before refrigerating it until serving. When ready pour into a tall glass with halfway full with ice and add the fresh mint to garnish. For the cocktail version, add 25-35ml of gin to a tall glass half-filled with ice, then fill 2/3 of the remaining glass with Rose Hibiscus Ice tea. Top with sparking lemonade and fresh mint to garnish.